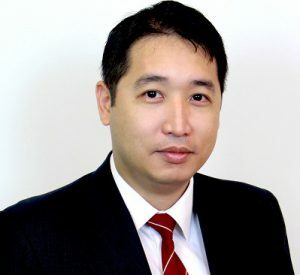 Positive renewal rate of 3.1% for Total Portfolio: This was from Singapore, where all property segments registered between 0.2% and 11.3% renewal rates. The exceptionally high 11.3% renewal rate in the Integrated Development, Amenities & Retail segment was attributable to a renewal at Aperia, which corresponds to its first renewal cycle. There were no renewals in Australia during the quarter. QoQ higher total portfolio occupancy from 91.6% to 92.0%: Singapore occupancy was higher QoQ from 89.2% to 90.1%, mainly due to expansions and new take ups at LogisTech, 40 Penjuru Lane and 2 Senoko South Road. 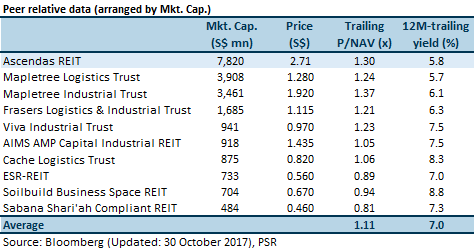 Gearing remains low at 33.1%: Available debt headroom of ~S$1.0 bn (assuming 40% target leverage), potentially growing the portfolio by ~10%. Australia occupancy was down QoQ from 99.8% to 98.7%: This was due to a non-renewal at 1A & 1B Raffles Glade, Sydney. (The lease ended on 30 June 2017.) A new lease has been secured for the space and will commence in 3Q FY18. The outlook is stable. There are no leases expiring in Australia for the remainder of the FY. 9.2% of Singapore leases by gross revenue expiring in the remainder of the FY. We expect recent acquisitions to drive gross rental growth in FY18 by 4.3% YoY and DPU growth of 0.9% YoY. Our forecast remains largely unchanged, after incorporating the 1H FY18 results, acquisition of 100 Wickham Street in Australia and divestment of 13 International Business Park during 2Q FY18. We do not incorporate the divestment of 10 Woodlands Link in 2Q FY18 in this instance, as it was divested before the 1Q FY18 results were announced and are already reflected in our estimates. We expect a stable 5.9% yield and our target price gives an implied FY18e P/NAV multiple of 1.35x, which compares against the FTSE REIT Index forward 12-months P/NAV multiple of 1.06x. A-REIT is trading above the peer average P/NAV multiple and at a lower 12M-trailing yield than the peer average.